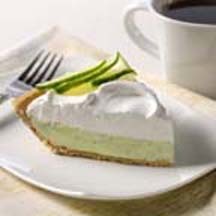 This no-fail recipe makes the easiest and best key lime pie you'll ever taste. Beat sweetened condensed milk and lime juice in small mixer bowl until combined; stir in lime peel. Pour into crust; spread with whipped topping. Refrigerate for 2 hours or until set. *Or use 2 cups sweetened whipped cream.